Explanation: Which of these night sky icons can you find in this beautiful and deep exposure of the northern winter sky? Skylights include the stars in Orion's belt, the Orion Nebula, the Pleiades star cluster, the bright stars Betelgeuse and Rigel, the California Nebula, Barnard's Loop, and Comet Lovejoy. The belt stars of Orion are nearly vertical in the central line between the horizon and the image centre, with the lowest belt star obscured by the red glowing Flame Nebula. 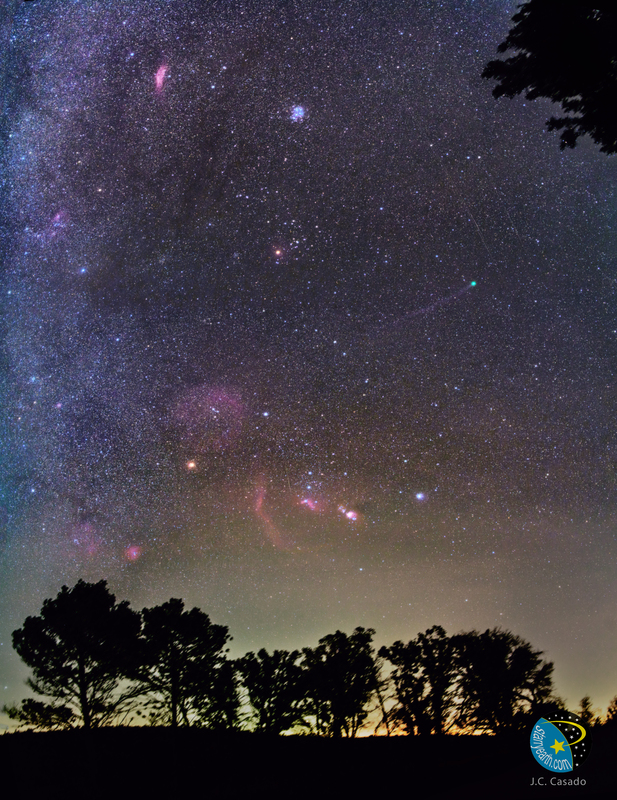 To the belt's left is the red arc of Barnard's Loop followed by the bright orange star Betelgeuse, while to the belt's right is the colourful Orion Nebula followed by the bright blue star Rigel. The blue cluster of bright stars near the top centre is the Pleiades, and the red nebula to its left is the California nebula. The bright orange dot above the image centre is the star Aldebaran, while the green object with the long tail to its right is Comet C/2014 Q2 (Lovejoy). The featured image was taken about two weeks ago near Palau village in Spain.